MERCEDES — As construction on the “light” industrial park in Mercedes nears completion, Development Corporation of Mercedes Executive Director Melissa Ramirez along with local leaders work to attract new businesses. 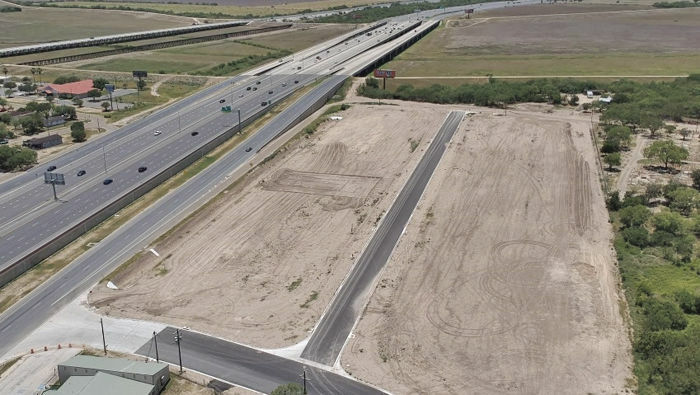 The development corporation has at least two interested business owners, who could potentially purchase property at the industrial park located northwest of Mercedes off West Interstate 2. “We have two solid prospects,” said interim City Manager Sergio Zavala, who could not disclose the interested buyers until the deals are finalized due to the sensitivity of the negotiations. In 2016, city and Development Corporation of Mercedes leaders began talks of potentially creating a light industrial park, which differs from a heavy industrial park in that subdivided property is marketed to industries like distribution centers or warehousing companies, rather than heavy industries, such as chemical or steel manufacturing. “It was a good vision with a lot of hard work behind (it),” Zavala said of the original plan to create a light industrial park. The city’s economic development arm purchased the property from three owners at a cost of $3.48 million, according to Ramirez. In an effort to bring in new businesses and increase the tax base, the property is then sold to developers. “The taxation (returned) should be a benefit (and) boost to the city as well,” Zavala said. The Development Corporation of Mercedes purchased the property with the help of Valley Telephone Company, which loaned it $2 million at no interest, according to Ramirez. The U.S. Economic Development Administration, through a grant, provided the city with funding used for infrastructure improvements, including the paving of Anaquitas Street. The industrial park project is nearly complete, with only two cellular towers in the property needing to be relocated. The property is subdivided into two phases with Phase I broken up into eight one-acre lots, which could be further subdivided, if needed. Phase II is a 34-acre lot located to the rear of the industrial park. “It would mean a very good start to infilling the industrial park, especially on the larger lot. It would mean jobs for people that need jobs,” Zavala said. However, the 34-acre lot deal has yet to close, and until it does, the business name remains a mystery. Once deals are sealed, announcements will be made publically. For now, the development corporation seeks developers to purchase property at the industrial park, according to Ramirez, who said incentives for potential buyers vary.